Fully insured Vehicles, Vehicles are ministry Inspected every 6 weeks, They are serviced at regular intervals, 3 point seat belts, Emergency exits, Fire Extinguishers, Driven by professional drivers holding full P.S.V. licences, All drivers have been police checked, Boot space for Airpot transfers, Individual blownair, Individual reading lights, Luggage racks, Curtains, Tinted windows, Roof hatches. With minibuses ranging from 16, 17, 19, 22 and 29 passenger seats. 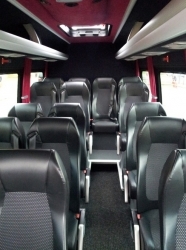 On VIP minibuses you can have reclining seats, full air con, DVD, separate storage area for your luggage.